Oil on marouflaged panel in good quality 18th century carved and giltwood frame. Signed with initials and dated 'Anno. 1631. JVR" upper right. A superb portrait of a gently smiling young woman; she wears a pearl necklace, the essential accessory of the period, but modestly conceals it beneath her fine muslin. No such modesty however, for the magnificent jewellery she wears across her bosom. Her black clothing, fashionably slashed, is of the finest quality, beautifully decorated and contrasting with the exquisite white lace spread across her shoulders. In the work of great portraitists black is never dull, its pictorial potential is fully utilised. Black is an ideal background against which gold can stand out to dramatic effect and to contrast with the crisp white linen and lace. This extreme opposition between black and white is both austere and exciting, and is a characteristic feature of the 17th century Dutch portrait. 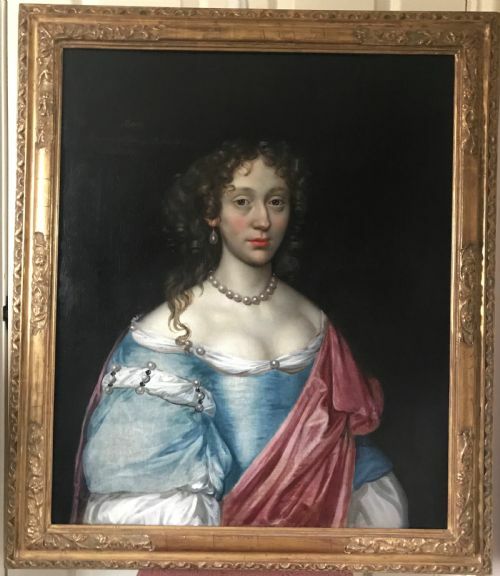 The theory has been put forward that the sitter is Amalia van Solms, wife of the Dutch Stadtholder (and grandmother of England's William III), who was painted many times by many different artists. Regardless of the identity of the sitter this is a superb and sensitive portrait by a famous artist from the Netherland's Golden Age of painting. (c. 1572-1657) was one of the most important and successful Northern Netherlandish portrait painters of the first half of the seventeenth century, and the leading portraitist of the government centre, The Hague. He was working there for the Stadholder's Court, for local patricians and for the upper classes of other cities in the Southern part of Holland and in Zeeland. His sitters are often depicted with rich costumes in the latest fashion, intentionally alluding to their wealth and status. His earliest signed work is the well-known tondo portrait of the young Hugo Grotius, dated 1599 (Fondation Custodia, Paris). As early as 1604 Karel van Mander mentioned the artist as one of the most competent portraitists of his time. A large number of signed and dated works from the next decades - especially from the year 1611 - are known, including several group portraits of the Hague civic guard. The last dated portraits are from 1641, leading to the conclusion that the painter produced little, if anything, in the last fifteen years of his life. The general style of his work is closely related to that of the Delft portraitist Michiel Jansz. van Mierevelt (1567-1641), but is generally less dry and often more flattering than the latter’s. SIZE: 28 x 24.25 inches panel size. 34.5 x 31.5 inches inc. frame. *Collection of Alfred Morrisson M.P. of Fonthill House, Tisbury, Wiltshire. (see image 10). Alfred Morrisson (1821-1887) was an outstanding collector of fine and rare items. *Latterly in the Private Collection of a Lady. VERSO: two Victorian printed labels bearing much information of "M & B Bartington; Est. 1836. No. 58 Wardour Street, Soho" framer and restorer. Victorian handwritten label "Alfred Morrisson Esq. No. 106. 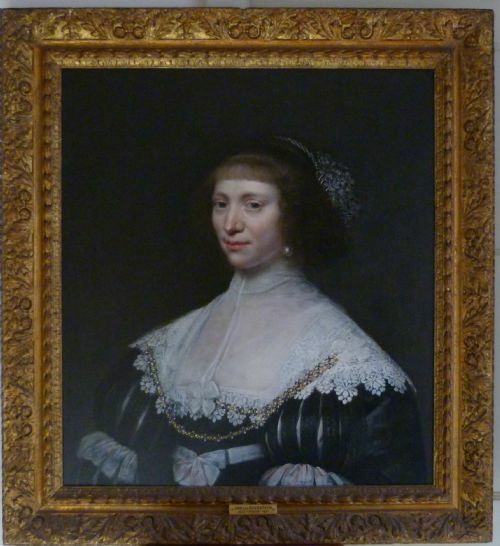 Three quarter picture of Dutch Lady by Jan van Ravesteyn. 20/12/87". 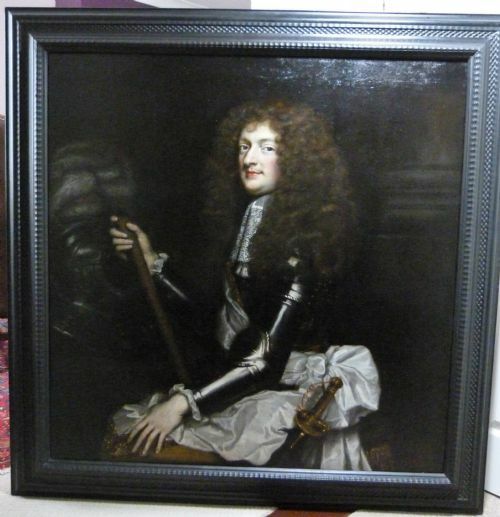 Oil on canvas; a superb quality portrait in a good 17th century carved and giltwood frame. 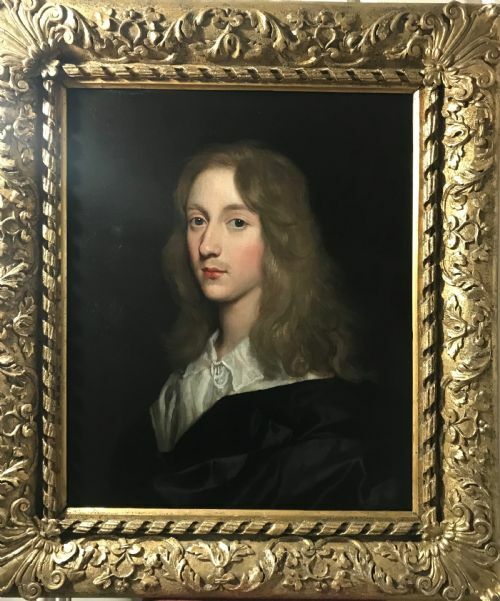 This powerful portrait has been known as Richard Cromwell, Oliver's third son, for many years, but, although the sitter bears a resemblance to the second Lord Protector, it is a doubtful attribution. Looking directly and frankly at the viewer the sitter, almost certainly a military officer, makes no concession to any of the more foppish fashions of the day. He wears his own hair, not a wig, his cravat is simple. His sleeves have a silver thread pattern and over all he wears a breastplate with a buff leather coat beneath. Although plain, all these items are of good quality...indeed, the young man must have been wealthy in order to commission such a high quality (and therefore expensive) portrait. The different textures and appearance of all these materials, and the flesh and hair, are exquisitely painted by Hoogstraten. Upper left, probably added in the 18th or 19th century, is the later inscription 'RICHARD CROMWELL', and to the middle right is another very faint inscription which seems to be contemporary with the portrait 'Aet. 23. Ano. 1666'. If this date and the sitter's age are correct then it cannot be Cromwell who was born in 1626. Samuel van Hoogstraten was born in Dordrecht on 2 August 1627. He was first the pupil of his father, then, some time after his father's death in 1640, he entered Rembrandt's studio. He painted genre scenes and portraits and he is well known as a specialist in perspective effects. Hoogstraten travelled widely, visiting Rome and Vienna, where he was patronized by the Emperor. He was in London from 1662 to 1666, the time of the Great Fire. He finally settled in his native town where he was made a Provost of the Mint. He published a book in 1678 "lnleyding tot de Hooge Schoole der Schilderkonst" (An Introduction to the Art of Painting), one of the few handbooks on painting published in Holland in that century. He died in Dordrecht on 19 October 1678. SIZE: 29 x 23.5 inches canvas. 36.5 x 31 inches inc. frame. PROVENANCE: Earl Granard K.P., Castle Forbes, County Longford, Ireland. (see image 6). VERSO: Stencil "Earl of Granard KP Castle Forbes". Oil on canvas in a good quality reproduction frame. This is a superb quality painting, the depiction of the various materials...silk, lace, gold, steel, hair and flesh is exquisite. Hands are often problematic with lesser artists but here they are totally realistic. The Duke wears the Bourbon white silk sash and holds the baton of command of a high ranking officer. PHILIPPE II, DUKE OF ORLEANS (1674-1723), Regent of France, the son of Philip I, duke of Orleans, and his second wife, the princess palatine, was born on the 2nd of August 1674, and had his first experience of arms at the siege of Mons in 1691. His marriage with Françoise-Marie de Bourbon, Mlle. de Blois, the legitimized daughter of Louis XIV, won him the favour of the king. He fought with distinction at Steinkerk, Neerwinden and Namur (1692-95). During the next few years, being without employment, he studied natural science. He was next given a command in Italy (1706) and in Spain (1707-08) where he gained some important successes, but he cherished lofty ambitions and was suspected of wishing to take the place of Philip V on the throne of Spain. Louis XIV was angry at these pretensions, and for a long time held him in disfavor. In his will, however, he appointed him president of the council of regency of the young King Louis XV (1715). After the death of the king, the duke of Orleans went to the parlement, had the will annulled, and himself invested with absolute power. At first he made a good use of this, counselling economy, decreasing taxation, disbanding 25,000 soldiers and restoring liberty to the persecuted Jansenists. But the inquisitorial measures which he had begun against the financiers led to disturbances. There existed a party of malcontents who wished to transfer the regency from Orleans to Philip V, king of Spain. A conspiracy was formed, under the inspiration of Cardinal Alberoni, first minister of Spain, and directed by the prince of Cellamare, Spanish ambassador in France, with the complicity of the duke and duchess of Maine; but in 1718 it was discovered and defeated. Dubois, formerly tutor to the duke of Orleans, and now his all-powerful minister, caused war to be declared against Spain, with the support of the emperor, and of England and Holland (Quadruple Alliance). After some successes of the French marshal, the duke of Berwick, in Spain, and of the imperial troops in Sicily, Philip V made peace with the regent (1720). On the majority of the king, which was declared on the 15th of February 1723, the duke of Orleans resigned the supreme power; but he became first minister to the king, and remained in office until his death on the 23rd of December 1723. The regent had great qualities, both brilliant and solid, which were unfortunately spoiled by an excessive taste for pleasure. His dissolute manners found only too many imitators, and the regency was one of the most corrupt periods in French history. SIZE: 52.5 x 51.75 inches inc. frame. PROVENANCE: Private collection, East Kent. Oil on canvas in 18th century giltwood frame. 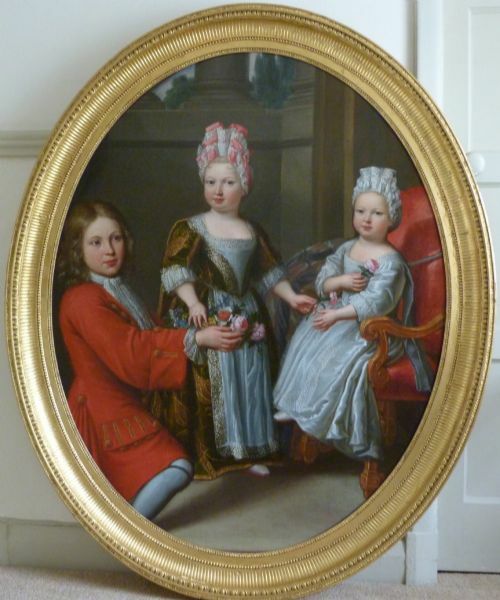 A superb quality large 17th century portrait of three children of the French nobility. Such is the splendour and expense of their fashionable clothing that the girls may be princesses, especially as a young gentleman kneels before them. Possibly some of Louis XIV's numerous progeny sired on his several mistresses. Louis legitimised these children and they all received titles. On the reverse of the painting is a very faint inscription which seems to read "Children of Louis 14th by Pierre Mignard". The painting has been reduced in size and changed from rectangle to oval, probably in the late 18th century,as that is the date of the frame, whether because of damage or for a decorative purpose is not known. PIERRE MIGNARD (1612-1695) was a member of a family of artists, he was a painter in the classical French Baroque manner, known primarily for his court portraits. In 1635 Mignard left the studio of Simon Vouet for Italy, where he spent 22 years and made a reputation that brought him a summons to Paris in 1657. Successful with his portrait of Louis XIV and in favour with the court, Mignard pitted himself against Charles Le Brun; he declined to enter the French Royal Academy, of which Le Brun was the head, and he organized the opposition to its authority. Mignard was chiefly active in portraiture; many of the beauties and celebrities of his day sat for him, including Molière, the Viscount de Turenne, Jacques Bossuet, the Marquise de Maintenon, the Marquise de Sévigné, and the Marquise de Montespan. His skilful technique and graceful arrangements are noteworthy. With the death of Le Brun (1690), Mignard succeeded to all the posts held by his opponent. These late honours he did not long enjoy. He died while about to commence work on the cupola of the Hôtel des Invalides. His brother Nicolas Mignard (1606–68) and his nephew Paul Mignard (c. 1638–91) were also accomplished painters. PROVENANCE: Collection of Maria Carmela, Viscountess Hambleden of Hambleden Manor, Buckinghamshire since the 1950s. This portrait was selected by John Fowler, of Colefax and Fowler, in the 1950s, for Hambleden Manor, home of the Viscountess Hambleden. It hung there until July 2013 when the countess moved to a smaller property on the estate. The decoration and furnishing of Hambleden Manor is regarded as one of Fowler's earliest major achievements. 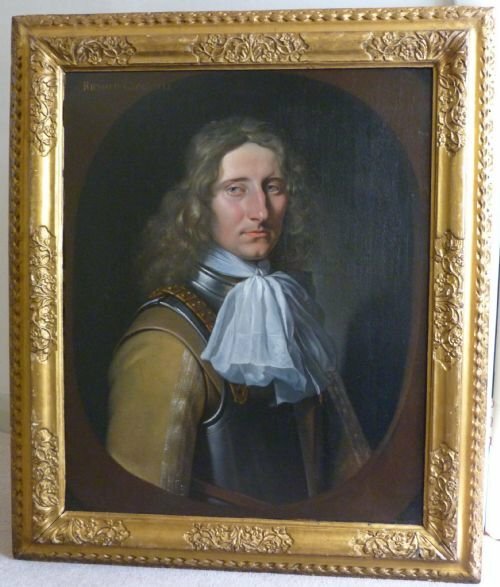 Oil on canvas in a gilt reproduction frame of correct type. This is a very high quality portrait typical of Wright's fine and sensitive work, with the haunting sense of character that Wright conveys. He would appear to have been far more interested in conveying intelligence than rivals such as Lely, and here, as always, we sense that the sitter is of an alert and enquiring mind. Inscribed upper left "Mary, Daughter of George Dodding Esq. A.D. 1677." This is almost certainly a portrait painted to mark Mary's marriage to Thomas Preston. The surname Dodding was first found in Somerset at Doddington, which predates the Norman Conquest dating back to c. 975 when it was first listed as Dundingtune. By the time of the Domesday Book in 1086, the village was known as Dodington. There are other places similarly named in the Domesday Book but this is the only pre-Conquest village making it of Saxon origin. In early days, some of the family were found much further north in Cumberland at Kirk-Oswald where the estates of Kirk-Oswald were granted by Elizabeth I to the Dodding family. Colonel Dodding was the son of Miles Dodding Esq, of Conishead Priory, Lancashire. Mary married Thomas Preston M.P. for Lancaster in, it is thought, 1677. Thomas was born in 1646 and died in 1697. He is buried at Cartmel, Cumbria. Mary's birth and death dates are not known, but the marriage was brief as Thomas married again and had two children from that union. There were no offspring from his earlier marriage, so it is very probable that Mary died in childbirth as was very common. JOHN MICHAEL WRIGHT (May 1617 – July 1694) was a portrait painter in the Baroque style. Described variously as English and Scottish, Wright trained in Edinburgh under the Scots painter George Jamesone, and acquired a considerable reputation as an artist and scholar during a long sojourn in Rome. There he was admitted to the Accademia di San Luca, and was associated with some of the leading artists of his generation. He was engaged by Archduke Leopold Wilhelm of Austria, the governor of the Spanish Netherlands, to acquire artworks in Oliver Cromwell's England in 1655. He took up permanent residence in England from 1656, and served as Court Painter before and after the English Restoration. He was a favourite of the restored Stuart court, a client of both Charles II and James II, and was a witness to many of the political manoeuvres of the era. Wright is currently rated as one of the leading indigenous British painters of his generation, largely for the distinctive realism in his portraiture. Perhaps due to the unusually cosmopolitan nature of his experience, he was favoured by patrons at the highest level of society in an age in which foreign artists were usually preferred. Wright's paintings of royalty, aristocracy and gentry are included amongst the collections of many leading galleries today. SIZE: 35.25 x 30.25 inc. frame. PROVENANCE: latterly in a private collection in Sidmouth, Devon. Oil on canvas in a magnificent carved and gilt frame. It shows Rupert at about the age of 14 when he first became a soldier. After a pattern favoured by van Honthorst who painted Rupert, at different ages, several times. His Studio and those of his Circle produced a number of versions of van Honthorst's portraits of the senior Royalists. Difficult to date precisely, most of these copies were produced around the middle of the 17th century, particularly during the time of the English Civil War and the King's execution in 1649. They were much in demand to adorn the private walls of Royalist supporters. Rupert, Count Palatine of the Rhine, Duke of Bavaria, Duke of Cumberland, Earl of Holderness, commonly called PRINCE RUPERT OF THE RHINE, KG, PC, FRS ( 1619 – 1682), was a noted German soldier, admiral, scientist, sportsman, colonial governor and amateur artist during the 17th century. Rupert was a younger son of the German prince Frederick V, Elector Palatine and his wife Elizabeth, the eldest daughter of James I of England. Thus Rupert was the nephew of King Charles I of England, who made him Duke of Cumberland and Earl of Holderness, and the first cousin of King Charles II of England. His sister Electress Sophia was the mother of George I of Great Britain. Rupert is considered to have been a quick-thinking and energetic cavalry general, but ultimately undermined by his youthful impatience in dealing with his peers during the Civil War. In the Interregnum, Rupert continued the conflict against Parliament by sea from the Mediterranean to the Caribbean, showing considerable persistence in the face of adversity. As the head of the Royal Navy in his later years, he showed greater maturity and made impressive and long-lasting contributions to the Royal Navy's doctrine and development. As a colonial governor, Rupert shaped the political geography of modern Canada—Rupert's Land was named in his honour. Rupert's varied and numerous scientific and administrative interests combined with his considerable artistic skills made him one of the more colourful individuals of the Restoration period. He built a considerable reputation both in the Dutch Republic and abroad. Queen Elizabeth of Bohemia, mother of Prince Rupert, sister of Charles I of England, then in exile in the Netherlands, commissioned Honthorst as a painter. Through her he became known to King Charles, who invited him to England in 1628. After his return to Utrecht, Honthorst retained the patronage of the English monarch, painting for him, in 1631, a large picture of the king and queen of Bohemia and all their children. His popularity in the Netherlands was such that he opened a second studio in the Hague, where he painted portraits of members of the court. These were large studios, where the work of his assistants included making replicas of Honthorst's royal portraits. SIZE: 32.5 x 28.5 inches including frame. 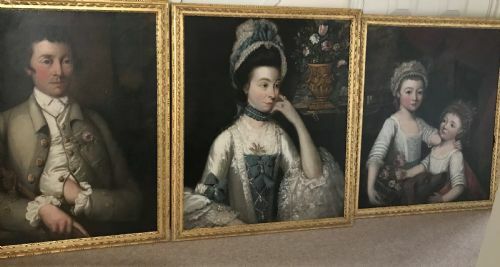 Three oils on canvas of the Leggat family, in carved and gilded frames. These are utterly charming images of a prosperous middle class family. It is rare for the group to have remained together for about 250 years and is nearly always the sign that the portraits have remained within the family. Husband Peter wears a rose in his buttonhole and carries a stick which appears to be of a ceremonial type. Clearly these items are of significance, but their meaning is not known. His wife Sarah, is dressed in a very fashionable and expensive manner. The flowers to her left are not just ornamental but signify her fruitfulness as a mother. The children, Jane and Elizabeth, also expensively dressed, are shown with a basket of flowers and a dog. Again, these are symbols; the dog may have been a pet but it also represents trust and faithfulness, and is a reminder that, as animals need to be trained, so do children. The flowers are for their future fruitfulness in marriage. In the background can be seen a fortified manor house, probably their home but also representing their ancient family history. The walls around it seem to be of Yorkshire drystone walling. The family have always believed that the portraits were by a Yorkshire artist, William Routh .. but no such artist is recorded. It is possible that Routh was a talented family friend and not a professional painter. This surname LEGGAT was derived from the Old French LEGAT, and was brought into England in the wake of the Norman Invasion of 1066. The name may have been given to an official elected to represent his village at the manor court. Early records of the name mention Geoffrey Le Legat who was documented in the County Devon in 1273 and Ricardus Leget of Yorkshire, was listed in the Yorkshire Poll Tax of 1379. Later instances of the name include a certain Richard Colfe who married Elizabeth Legget at St. Dionis Backchurch, London in 1585. Henry Legit married Catherine Eagan, St, George's. Hanover Square, London in 1770. SIZE: framed; 34 x 28.5 inches (the adults); the children 33x 28.5 inches. PROVENANCE: By descent through the family in Yorkshire. Accompanying the portraits are several old family documents and a Book of Common Prayer given my Peter to his father John in 1786. It must have been well used as a note says it was rebound in 1812. Oil on canvas in a modern reproduction frame. As the most notorious and most frequently painted of King Charles II's mistresses, Barbara Villiers Duchess of Cleveland remains one of the most enduring symbols of the indulgences and excesses of the Restoration Court. This portrait derives from a work by Sir Peter Lely painted c.1662. A portrait, identical to this one, apart from being painted within a feigned cartouche, sold at Bonhams in December 2003 for £10,157 including buyer's premium. 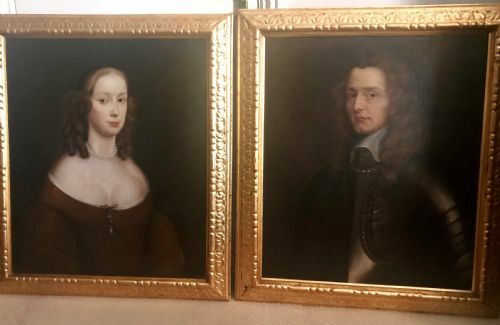 At the Restoration Villiers was established as the king's favourite mistress and despite his marriage to Catherine of Braganza and the jealousy of other courtiers, she maintained a powerful influence at Court. At least three of her children were acknowledged as his by the king and by 1665 she was termed the 'maitresse en titre'. Among her various liaisons was one in 1668 with the actor Charles Hart in retaliation for the king's growing attraction for actresses such as Moll Davis and Nell Gwyn. In 1670 she was created Baroness Nonsuch, Countess of Southampton and Duchess of Cleveland. This was a reward for her services but also a compensation for retirement. By the early 1670s her influence had been entirely supplanted by Louise de Kéroualle, Duchess of Portsmouth. After this she spent some time in Paris before returning to England a few months before Charles II's death in 1685. On the death of her husband Roger, Earl of Castlemaine in 1705 she married Major-General Robert Fielding, a bigamist who was jailed for threatening and maltreating his wife. She died at Chiswick on 9th October 1709. Among her various illegitimate children by the King were the Duke of Grafton, the Duke of Southampton and Lady Charlotte Fitzroy, Countess of Lichfield. Portraits of Villiers, and other of the king's mistresses, were much in demand and many copies were produced to satisfy this market. They were not cheap; Samuel Pepys could not afford one and had to settle for a print. SIR PETER LELY (1618 - 1680) was the most important portraitist in the reign of Charles II, although he had painted portraits throughout the Commonwealth. Principal Painter to the King, he painted everyone of importance, maintaining a busy and active Studio to help with the huge demand for his portraits. Members of his Circle, and his Followers, many of them talented artists in their own right, emulated his style to supply this constant market. SIZE: 35.25 x 30.75 x 2 inches including the frame. *Derbyshire Private Collection. (Verso; a trade label for a now defunct Ticknall restoration studio). Oil on canvas in the original Regency gilt frame. This is a superb portrait of the young nobleman, sensitive and insightful, his hair in the fashionably Byronic style. It is a fine example of the best work of Devis. THE HONOURABLE FREDERICK JOHN SHORE, (1799-1827), 2nd son of the 1st Lord Teignmouth, Governor General of India and anti slavery campaigner. The sitter was born in England in May 1799 and married Charlotte Mary Cornish (1800-1883), the daughter of his mother's younger brother, in January 1830. He was the author of "Indian Affairs", a noted political treatise, whilst an employee of the East India Company. At this time the East India Company ruled large areas of India with its own private armies, exercising military power and assuming administrative functions. Company rule in India effectively began in 1757 and lasted until 1858 when, following the Indian Rebellion of 1857, the Government of India Act 1858 led to the British Crown assuming direct control of India in the form of the new British Raj. An old handwritten label verso informs us that Frederick was killed "at the storming of a Robber Fort in India" two days before his 38th birthday. His wife bore him three children, Louisa Sara, Arthur Frederick and Clara Maria. ARTHUR WILLIAM DEVIS (1762 - 1822). Devis was the son of Arthur Devis, a successful portrait painter. Devis enrolled at the Royal Academy Schools at the age of twelve and exhibited at the Royal Academy from 1775. In 1782, he embarked aboard the Antelope for a voyage to the East Indies, in the capacity of draughtsman. The ship was wrecked and Devis and the crew were stranded for a year on an uninhabited island in the Pacific Ocean. After a series of extraordinary adventures, during which he took part in the wars of the natives on a neighbouring island and received two arrow wounds, Devis arrived in India, where he settled for ten years, establishing a successful practice as a painter of portraits and local scenes. He attracted the attention of Sir William Jones, Lord Cornwallis and General Harris. He returned to England in 1795, concentrating mainly on painting portraits and a few notable history subjects. Perhaps his best known painting is the famous "Death of Nelson". SIZE: 39 x 34.25 inches inc. frame. PROVENANCE: By descent in the family of the sitter. VERSO: two old handwritten labels, one described above, the other inscribed 'Property of Hugh Shore'. A modern label inscribed 'Lady Teignmouth'. Oil on canvas in a period carved giltwood frame. 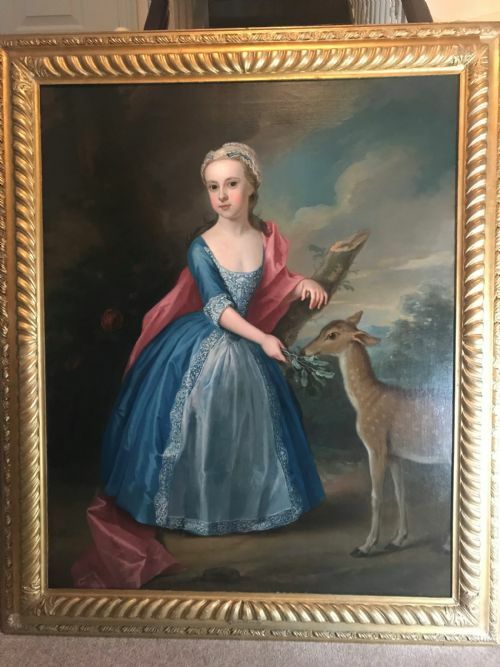 This is a charming portrait of a girl of a wealthy family depicted feeding a deer; the animal may have been a pet but is more likely to be symbololic. In the Christian world, the deer is a symbol of piety, devotion and of God taking care of his children; in mythology the female deer symbolizes beauty, femininity, gentleness and grace. The blossoming rose to the left of the girl is a symbol of her youth, beauty and future fruitfulness. The sitter wears fashionable clothes trimmed with very expensive lace. He was a leading portrait painter by 1711, painting much in the style of Sir Godfrey Kneller (Principal Painter to the Royal Court), when he was appointed a founding director of Godfrey Kneller's Academy in London; among his pupils there was George Vertue. 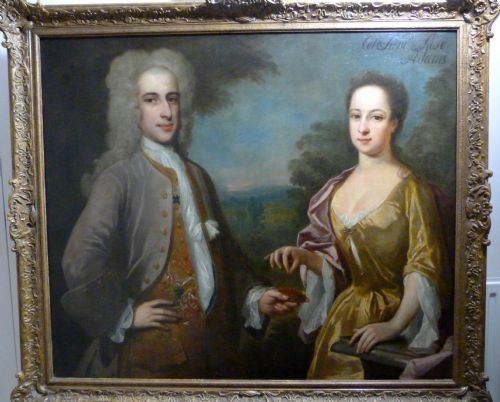 Gibson's sitters included a number of important public figures: Dr Henry Sacheverell (1710; Oxford, Magdalen Coll. ), John Flamsteed (1712; Oxford, Bodleian Lib. ), Sir Robert Walpole (untraced; engr. G. Bockman), Archbishop William Wake (Oxford, Christ Church Picture Gallery) and Archbishop John Potter (London, Lambeth Palace). His most constant patron was John Poulett, 1st Earl Poulett (1663–1743), who commissioned a great number of originals and copies. Gibson's career was interrupted in 1729-31 by serious illness, and he was obliged to sell his collection and for a time retire to Oxford. After resuming his practice he was patronized by Augusta, Princess of Wales, who in 1742 commissioned a group portrait of her four children, as well as her own portrait (both British Royal Collection). SIZE: 59 x 45 inches framed. 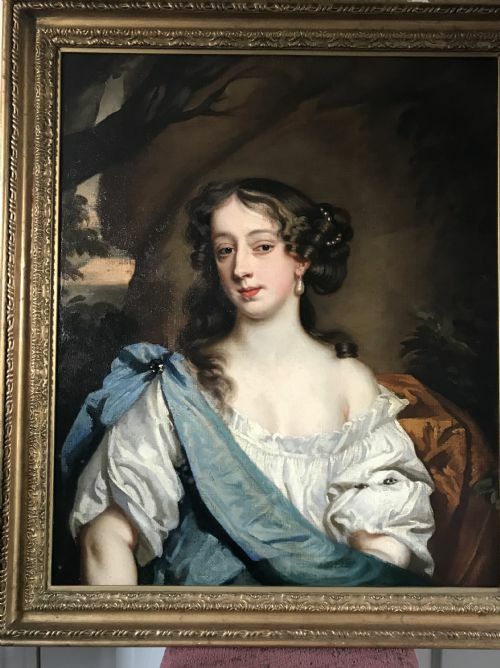 PROVENANCE: The Collection of the late Anne, Lady Winnington of Brockhill Court, Worcestershire, and London. Oil on canvas in reproduction 18th c. style gilt frame. Inscribed, upper right, 'Col.n Sam & Rose Adams'. A pleasing double portrait of Colonel Samuel Adams and his wife Rose, to whom he offers his snuff box for her to take a pinch. This is most unusual in portraiture. (Snuff is a product made from ground or pulverised tobacco leaves. It originated in the Americas and was in common use in Europe by the 17th century. It was generally inhaled or "snuffed" through the nose, usually directly from the fingers. PHILIPPE MERCIER (also known as Philip Mercier; 1689 in Berlin – 18 July 1760 in London) was a French painter and etcher, who lived principally and was active in England. He was born in Berlin of French extraction, the son of a Huguenot tapestry-worker. He studied painting at the Akademie der Wissenschaften of Berlin and later under Antoine Pesne, who had arrived in Berlin in 1710. Later, he travelled in Italy and France before arriving in London—"recommended by the Court at Hannover"—probably in 1716. He married in London in 1719 and lived in Leicester Fields. 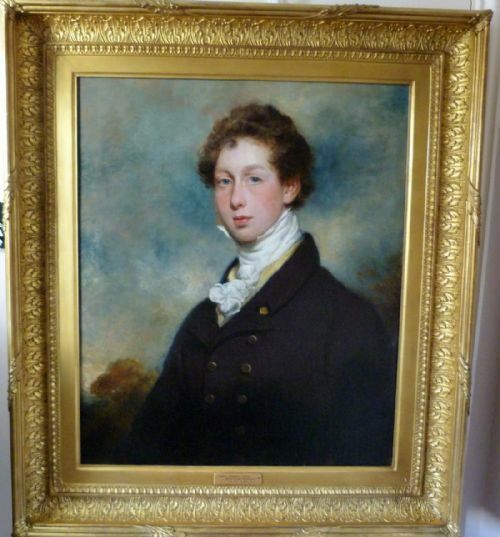 He was appointed Principal Painter and librarian to the Prince and Princess of Wales at their independent establishment in Leicester Fields, and while he was in favour he painted various portraits of the royals, and no doubt many of the nobility and gentry. Of the royal portraits, those of the Prince of Wales and of his three sisters, painted in 1728, were all engraved in mezzotint by Jean Pierre Simon, and that of the three elder children of the Prince of Wales by John Faber Junior in 1744. Mercier became involved in a scandal of sorts and he lost favour. He left London around 1740 and settled in York, where he practiced portrait painting for over ten years, before returning to London in 1751. In 1752, Mercier went to Portugal at the request of several English merchants. He did not long remain there, however, but came back to London, where he died in 1760. SIZE: 45 x 51.5 inches inc. frame. *Edward Abadam, Middleton Hall, Carmarthenshire, thence by descent. *With Roy Precious Fine Art. * Collection of a Fellow of a Cambridge College. Verso: old inventory number; old Christie's stencil; old handwritten label "Colonel Samuel & Mrs. Adams. P. Mercier. To Christie's York from Vaughn, 102 Westbourne Ave. Hull"